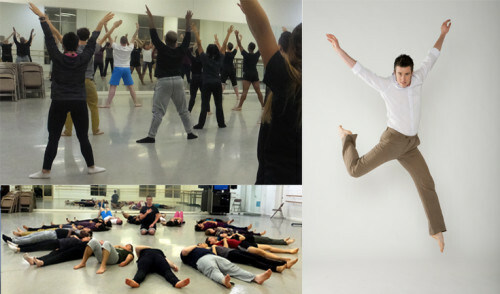 This welcoming, super-friendly workshop is led by transgender choreographer and dancer Sean Dorsey. The workshop will include breathing and relaxation, very gentle stretches, gentle (beginner) movement, self-expression exercises, and space for conversation and sharing. This is not a “dance class” — there will be elements of stretching and movement/dance … but also creative exercises and conversation. Please join us! Please come a little early to arrive, change clothes, etc; the workshop will start at 1pm. The front door, elevator, workshop space and bathroom are wheelchair accessible. * WHAT SHOULD I EXPECT? Sean will open with some breathing and relaxation, then will lead the group through some very gentle stretching and movement exercises. The group will create our own simple movement ideas and do some self-expression exercises … and we’ll finish with some more breathing and relaxation before sharing our experience and conversation together. No experience necessary! This will be super-friendly, non-judgmental, and for ALL levels, including TOTAL or TERRIFIED beginners! This is about loving up our unique bodies and creating safe space for us all to express ourselves. * WHAT SHOULD I WEAR? Wear clothing that you’re comfortable in – and that you can move freely around in (including laying on the floor). Please wear sweatpants, loose shorts, loose pants, leggings or any other comfortable bottoms and a comfortable shirt. You can choose to be barefoot or wear sneakers. * YIKES! I’M AFRAID TO MOVE OR DANCE IN PUBLIC! We know that transgender and nonbinary and LGBTQ people often don’t feel welcome, safe or comfortable in dance studios or classes … so please know this is truly going to be a super-friendly environment! And again: this is not a “dance class” — there will be elements of stretching and movement/dance … but also creative exercises and conversation. * WILL WE WEAR SHOES? You can choose to be barefoot or wear sneakers – whatever is more comfortable for you! * DO I HAVE TO TALK? We will be doing a supportive creative exercise that involves speaking outloud, and we will spend the last part of the workshop reflecting and sharing conversation … but you can choose not to talk if you prefer! Please let Sean know when you arrive that you prefer not to speak outloud. * OKAY, BUT YOU DO REALIZE I’M TERRIFIED, RIGHT? Yes, absolutely! This is a very gentle, slow-moving workshop … and there will be lots of options and adaptations so you can make sure your body feels good. You can sit down or rest at ANY time too! * NO REALLY, I’M SUPER TERRIFIED AND I’VE NEVER TAKEN A DANCE CLASS … SHOULD I STILL COME? Heck yeah! This is a super supportive, loving environment that is super supportive and welcoming of the super terrified! Being really nervous or scared is a really common and normal feeling, and we understand what it feels like. Please come and join us!